One of the new "Star Wars" toys that become available today (Sept. 4) is the adorable robot BB-8. Everyone seems to be talking about the BB-8 RC robot. Its amazing technology and adorable physicality make it feel more like a pet than a toy. Check out the great video, posted below, from Yahoo Tech's Dan Howley to see what I mean. The accompanying article also includes a description of the technology behind this little 'bot. 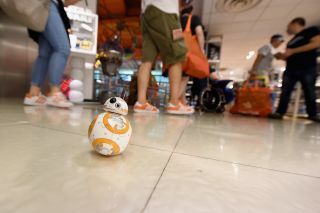 Many of the fans we interviewed at last night's Times Square Toys "R" Us midnight reveal said they were there to buy the BB-8, which was one of the few toys that was widely reviewed prior to last night's big reveal. Do you prefer the classic, swordlike lightsaber, like those wielded by Luke Skywalker and Obi Wan Kenobi? Are you partial to the tri-pointed saber wielded by Kylo Ren? Or do you want a totally unique lightsaber design? The Bladebuilders Jedi Master Lightsaber offers over 100 lightsaber combinations. The kit comes with a main lightsaber blade featuring lights and sounds, two light daggers that also light up, plus multiple hilt pieces including an expansion hilt, two elbow connectors, a dual connector and a cross connector. "Star Wars: The Force Awakens" isn't due out until Dec. 18, but based on the brief teaser trailer, X-Wing pilot Poe Dameron looks awesome. Let's hope the character lives up to the hype, because these black X-Wing vehicles are also extremely tempting. Technically, this is two different toys: the classic action-figure vehicle (equipped with projectile cannon, moving wings, plus Dameron and BB-8 figures) and the Lego building kit (this one is packed with features: four spring-loaded shooters, two stud shooters, retractable landing gear, opening wings, opening cockpit, three minifigures, a BB-8 minifigure and much more). This isn't the first time Lego has produced a Millennium Falcon building kit, but the earlier edition of the kit is now retired, so it's hard to find one for less than about $250. The new "Force Awakens" version of the classic ship may be even better than the last one: According to the "Star Wars" Lego homepage, the new Falcon is "crammed with new and updated external features, including an even more streamlined and detailed design, [a] detachable cockpit with space for two minifigures, rotating top and bottom laser turrets with hatch and space for a minifigure, dual spring-loaded shooters, [a] sensor dish, [a] ramp, and an entrance hatch." The description goes on and on about the inside of the ship as well. It comes with six minifigures, including a silver-haired Han Solo. While the high-tech options made available on Force Friday are certainly something to behold, sometimes the best toys are those that leave the most to the imagination. So we're also loving the new action figures that were released today, based on characters from the new movie, including Rey, Finn, Poe Dameron, Kylo Ren, Chewbacca and new Stormtroopers, as well as classic figures such as Luke Skywalker and Darth Vader. There are multiple new action-figure lines, including the 3.75-inch (9.5 centimeters) "Build-a-weapon" figures that come with additional weapon accessories ($7.99); the 3.75-inch "Armor up" figures that come with additional armor accessories ($12.99); the 12-inch (31 cm) action figures ($9.99); and the "Black Series" 6-inch (15 cm) action figures, which are more detailed and probably better for display ($19.99). These toys are classic, affordable and the only type of toy that never feels dated.